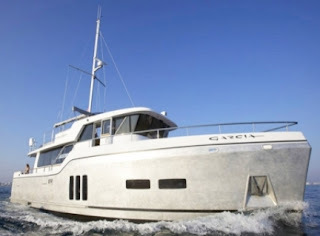 Presented in Cannes, the first motor boat from thirty years experienced North France alloy boat builder Garcia the GT54, has seen a lot of attention going towards it from the press and long range cruisers alike. Fair to say Garcia brings a lot of nice features to its GT54 from the looks department which resemble those of a trawler boat from the future, to its customisable layout available with two, three or four cabins. Just to make also things more exciting hull one displayed in Cannes of the GT54 also had a nice silver colored hull, and a minimal finished interior which are usually more associated with fast planning boats. Many builders are trying to give the trawler explorer yachts young looks, and I think Garcia has pushed a couple of new buttons in this direction, which will be appreciated by the a less conservative crowd. Still fair to say this is a custom project and it would not be surprising to see hull two full of classic features.